'I am comes' from a seemingly ordinary man, who underwent, in his own estimation, a transformation in his self-awareness and understanding of his place in the universe. Working in the financial industry, feeling somewhat disenchanted with his (considerable) material lot, he turned inwards, looking for answers. And it seems he found more than he had ever hoped for. The immediately impressive aspect to this book, is that it does not labor too hard to be a 'self help' manual. The self-help moniker is unhelpful, usually because the quick-minded are immune to any 'painting-by-numbers' methodology, as we live unfortunately in an age of vast, overcooked cynicism. What this book turns out to be, is in fact, a kind of antidote to this general weariness and disenchantment -- it is a back-to-basics fundamental look at the nature of the human soul, where it has gone wrong, why it has gone wrong and how it can be fixed. This is not 'the human soul for dummies'. That's not to say that this is a book without flaws. The writer's style is verbose. Sometimes his enthusiasm for his subject matter gets the better of him, and he goes off on many flights of fancy which should really have been reigned in by some judicious editing. All-in-all, it's probably 40 or 50 pages longer than it needs to be. Some sections demand to be reread, because the writer becomes bogged down by the weight of his stylized passages. However, it is encouraging that I actually felt a desire to go back and reread certain parts of this book, rather than cynically ploughing on, bemoaning my failure to grasp every intricate detail. Perhaps it was the message that the author had already successfully communicated to me, which permitted me to return to parts of the text which had eluded my understanding. The book is full of gems of wisdom. I suppose you might describe grappling with this book, as like sifting for nuggets of gold. There is plenty of extraneous text, but when you examine closely, what you unearth makes it a genuinely worthwhile read. I am reluctant to say that any one book has the power to completely change your life. What Falco does is offer you the opportunity to do exactly what he has done. Change comes from looking within. Sometimes we need a catalyst, or a guide, to awaken us to the possibilities. The main idea which impressed itself upon me after reading this book, is balance. In all areas of our lives, we benefit when our thinking and our action is guided by a level-headed, balanced view of reality. There is so much common sense in 'I am'. It might not be one hundred percent original. Many of the ideas have been laid out before, however, the combination of the writer's flowing style, his general enthusiasm for the subject, his genuinely insightful moments of wisdom, and his balanced and pragmatic approach to life, make this an interesting experience. The section on the nature of the human ego was a particularly well-written and informative part of 'I am'. It felt as if the author had taken large tracts of my own life and rammed them under his microscope. Certain books do allow you to step outside the perimeters of your own self-limiting-psychology and help you to take a broader view of the human mind, of experience. They afford you the chance to analyze your own behavior and your own thinking, in terms of universal ideas. In other words, you can see exactly how you have been functioning much the same as anyone else -- the same mistakes, the same self-protective ego doing its best and worst to help you through. 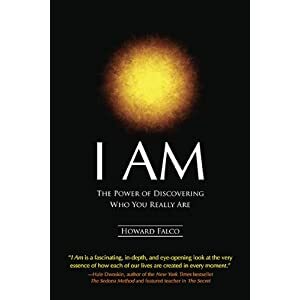 'I am' puts you in the privileged position of outside observer to the best and worst of yourself and through the insights gained, it's possible that you could improve your own psychology and thinking, purely by being aware of the larger, universal processes and adapting accordingly. Some might say that the mind and the soul are far too complex things to be broken down into working parts capable of being restructured for the benefit of the whole machine. Falco would probably disagree. I think he is essentially trying to communicate the idea that wisdom comes from simplicity and that nothing is actually that complicated. And maybe he is right. It's the over-complexity of the world at present which makes a book like this especially interesting, as 'I am' works like an antidote to that over-complexity, if being slightly guilty at times (due to the overwriting of certain chapters) of the very same thing.